....can be the basis to a wide range of ill-health issues. The problem is that there is a “grey zone”, during which this gland is only under-functioning yet causing a lot of health issues. Unfortunately, this level of thyroid disease is not “visible” to the tests normally used by doctors, such as the TSH, FT3 or FT4. Result? 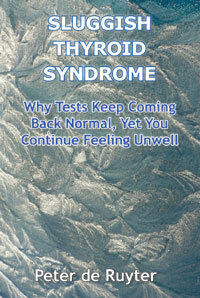 Most times your symptoms are dismissed as being due to “stress” – or you’re seen as a hypochondriac. This selfhelp eBook explores the many reasons why your symptoms are valid, despite not being visible, medically, and what alternative choices you do have to get better again. Would You Like To Read a Bit From This Self Help eBook Before Deciding To Buy? If the answer is 'yes', simply click on this link here, which will bring you to a PDF sample from this self help eBook.